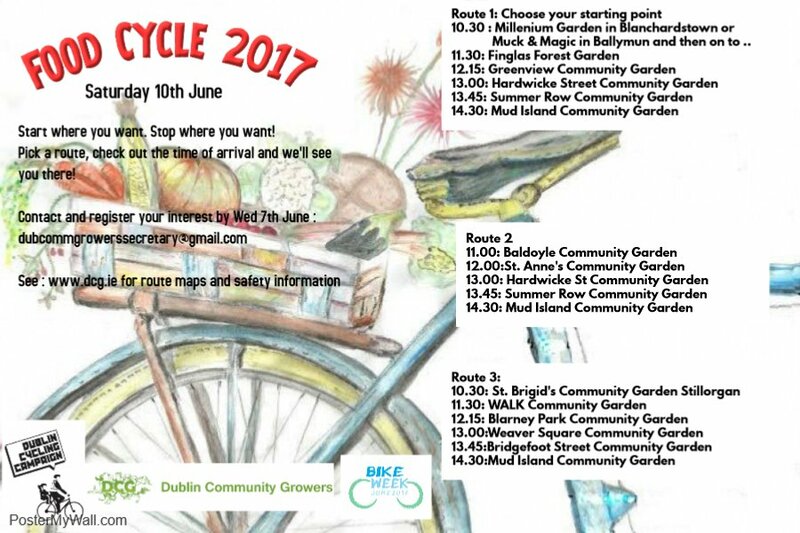 The 2017 Dublin Community Growers (DCG) “Food-Cycle Event” is just around the corner, and will be setting off this year on Saturday 10th June 2017 at 10.30am. More details here. Route 1 has 2 starting points and you can chose to start at either Millennium Community Garden in Blanchardstown OR Muck & Magic in Ballymun. These routes will then join up in Finglas Forest Garden and continue on from there. Route 2 will begin in Baldoyle Community Garden and Route 3 in St. Brigid’s Community Garden in Stillorgan. The maps give estimated times for departure from each garden. However, we wish to stress that ALL are welcome to come along to visit the gardens and it is a fantastic opportunity to visit some of Dublin’s hidden green spaces full of rich biodiversity and nature’s treasures. So if cycling isn’t your thing , please join in anyway and visit as many or few as you can on the day on foot, car or bus. Of course we would encourage greener travel choices , but we’d love to see you there by hook or by crook. All routes will head into the city centre and will meet up in Mud Island Community Garden at Clinch’s Court in North Strand. Here the wonderful people of Mud Island will have their new pizza oven fired up for us for some tasty treats and tea and coffee. We would ask you to bring a packed lunch and water for the cycle as we may not be able to cater for individual requirements. Mud Island have asked us to tell you that they will provide fresh toppings from the garden (YUM) but if you wish to have meat etc that you bring it along yourself on the day.